Could this be the “Magic” at last? 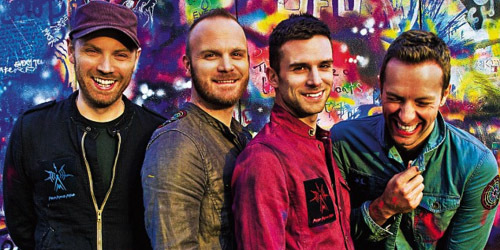 We have a new one at the top this week — leaping from 3-1 is Coldplay, who now have their fifth #1 on my top 40 with “Magic”. It’s the first radio single from the group’s forthcoming album, Ghost Stories, due on May 19. Their previous four chart-toppers were 2008’s “Viva La Vida”, 2011’s “Every Teardrop Is A Waterfall” and “Paradise”, and 2013’s “Atlas”. Look for four songs to jump into the top ten next week, the most action upward into that region during one frame in several years. Still, with hot singles by A Great Big World (which takes the Biggest Mover title for the second week in a row), Clean Bandit/Jess Glynne, Passenger and Rixton, it’s certainly worth accommodating for. Will all four be able to reach the top spot? Highly doubtful, but with a faster turnover rate, anything can happen. Of this week’s four debuts, Ed Sheeran debuts the highest at #30 with “Sing”, and no, I’m afraid that it’s not a hot Carpenters remake. (That would sound pretty peculiar anyways.) It’s his fourth chart entry to date; his biggest, “The A Team”, spent a week at #1 in April 2012. His sophomore album, X (read as “multiply”), streets on June 23. Further down are the other three debuts this week: Katy Perry lands at #38 with the latest single from PRISM, “Birthday”, while Canadian duo Chromeo enter the chart for the very first time at #39 with “Jealous (I Ain’t With It)”. Finally, at #40, is one of three songs in the countdown for boy band One Direction. “You & I” is the U.S. followup to “Story Of My Life”, which recently spent three weeks at #1. Next week looks like another hectic week for debuts with potential entries from British DJ/producer SecondCity, the yet-to-be-identified “disco supergroup” known as Disco Mystery and Canadian rockers MAGIC!. Who gets in and who gets shut out? Find out next Sunday. Neon and on at #1. After a huge debut at #26 last week, Passenger takes a leap up nine spots to #17 with “Scare Away The Dark”, his fourth top 40 single. On the chart dated April 7, 2013, one year ago, his debut hit “Let Her Go” took a similar jump from 25-18. Look for it to make the top ten in the next two weeks or so. “Scare” leads off Whispers, due June 10. Their latest hit is “Already Home” and duo A Great Big World have proved that they are indeed at home on the countdown. They jump from 39-24 this week, the Biggest Mover on this week’s chart. It’s the followup to “Say” Something”, which peaked at #2. Parent album Is There Anybody Out There? remains one of my favorites of the year so far. It appears that Foster The People‘s “Coming Of Age” has officially outgrown Alternative radio as it begins its descent out of the top ten, but followup “Best Friend” is already making some moves. On my chart, it climbs from 36-28. Other acts to break the top 40 on the Hot 100 talking about their best buds or people associated with them include Ral Donner & The Starfires in 1961, Queen in 1976, The Cars in 1978 and Brandy in 1995. The week’s only debut at #38 belongs to Sheppard, the Australian sextet from Brisbane who charted twice last year with “Let Me Down Easy” (#10) and “Hold My Tongue” (#1 for 2 weeks). Their third entry, “Geronimo”, is their first for Decca Records and is already a top ten sales hit in their native country. Bombs away! With new songs debuting next week from Ed Sheeran (“Sing”) and OneRepublic (“Love Runs Out”), it’s bound to be a busy week in music. Check back and see how they and all the rest of your favorites fare on next week’s countdown! A little shut-eye can’t shut them out of #1. Biggest Mover this week is by Bleachers, the new group featuring fun.‘s Jack Antonoff. The first single from their forthcoming album is “I Wanna Get Better”, soaring from 36-26. 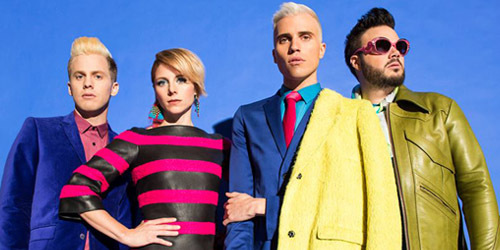 They’re set to play at SXSW this Wednesday night at a showcase for television network Palladia. The only newcomers to debut on the chart this week is the British quartet Rixton, who come in at #39 with “Me And My Broken Heart”. Their EP of the same name will be released digitally on March 18. The group recently signed to Interscope Records and are currently managed by Scooter Braun, whose empire of acts like Justin Bieber and The Wanted has crumbled in recent months. Lastly, down at #40, is a new single from former American Idol winner Phillip Phillips. “Raging Fire” is the first release from his forthcoming second album, due later this spring. His biggest entry to date, “Gone, Gone, Gone”, rose to #2 for two weeks last year.